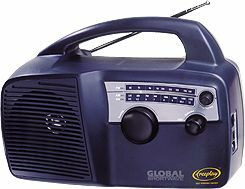 The Freeplay FPR2S-GSW ends the need to ever think of batteries again, the Freeplay Global Shortwave will play anytime, anywhere offering dependability and exceptional sound quality with global shortwave reach. The Freeplay Global Shortwave will play for up to an hour under spring power alone, after winding for a few seconds. With its solar panel the radio will save spring power by switching automatically to make use of all available light. It will play all day in direct sunlight and, for additional convenience, can also be powered through an AC/DC wall adapter (optional). Coverage is AM 500-1700 kHz, shortwave is 5-18 MHz and FM is 88-108 MHz. This radio represents shortwave dependability indoors and out. And when the lights go out, put the power back into your own hands with the Freeplay Global Shortwave - robust performance around the world, without batteries, without fail. A 4 inch speaker provides full audio. A built-in ferrite bar is the AM antenna, and the telescopic antenna is used for FM and shortwave reception. The case is Navy blue. Size: 11.5 x 8 x 8 inches 5.1 Lbs. (290x200x200 mm 2.4 kg). Internal Power Source: B-Motor textured carbon steel spring, driving a DC generator through a transmission. Approximately 55 turns provides full energy storage. External Power Source: Jack for AC adapter [center positive] 6V DC/100mA [min]. Solar Power Source: High performance amorphous thin film Solar panel with a 3.0V 50mA output. Spring Saver: This circuit allows playtimes of up to 60 minutes. At low power demand, this device stores generated energy not required by the Radio, resulting in a slower unwind rate. Copyright 2000-2011 Universal Radio, Inc.